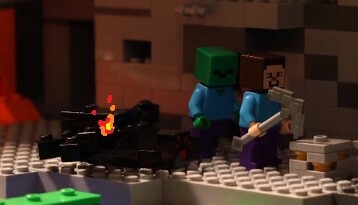 Steve stares at the pickaxe, frustration apparent. He hurls it over his shoulder in exasperation. Again the pickaxe lands in the lava lake with a plop. But this time a drop of lava splashes from the lake right onto the spider’s foot. It catches fires. Hot footed, the spider spins in a panicked circle, and in the process, sets fire to the zombie. The zombie and spider scramble randomly in panic. Eventually, they collide caroming over the edge into the water. Hearing the bump, Steve looks around in confusion. The spider or the zombie heads are poking up out of the water just by the stone edge nearest Steve, hidden from his view. Their expressions are sad, from being uncomfortably wet and missing out on a yummy Steve snack. Seeing nothing, Steve returns his attention to gold ore, shaking his head. Why hasn’t it broken? Steve kicks the block of ore in frustration. The block crumbles revealing a golden nugget. Steve is taken aback for a second. It is very strange, but the opportunity should not be wasted. Steve quickly bends and picks up the nugget. Love it, it's like a Charlie Chaplin!